Every now and again a bird sits still enough for me to get a half-decent photograph with my phone. 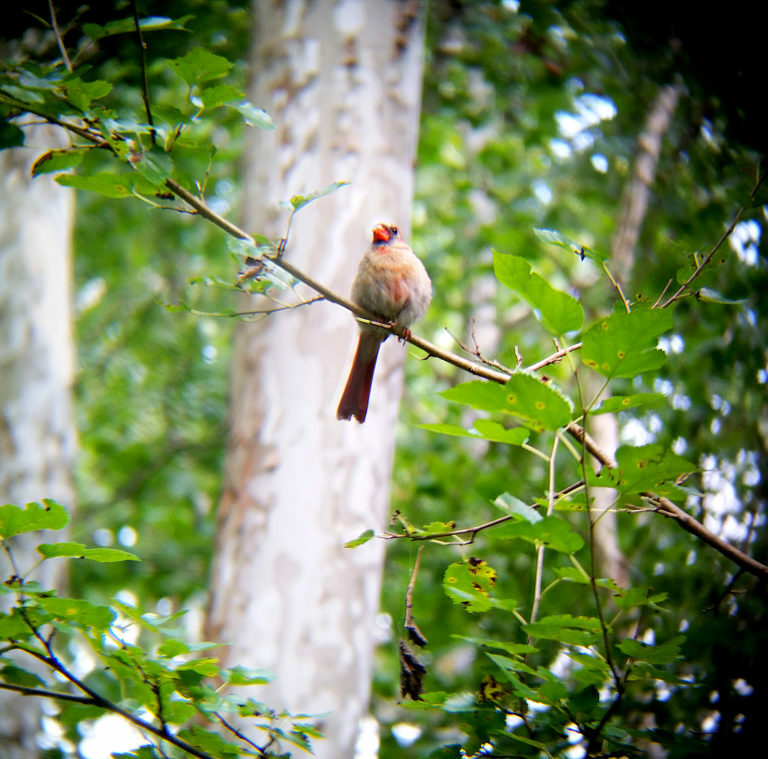 That was the case with the above photo of a female Northern Cardinal at Lake Roland this past Friday. I purchased a device that allows me to attach my phone directly to my binocular eye piece, which helps, and shows that it is possible to get good-looking bird photography with such a budget setup. In order to potentially snap photos of birds that tend to be farther away, or more mobile, I’m going to need something a bit more stationary. I’ll be experimenting with a binocular + tripod setup sometime soon. As I’ve mentioned on this blog, one of my favorite birds is the Indigo Bunting, and I was able to capture a short video of one on Friday as well. In July, I saw 65 unique species of bird, and upped my total species count to 80. Aside from a trip to my parents’ house in PA (where I added a Bald Eagle, Northern Parula, Rose-breasted Grosbeak and Black-capped Chickadee to my life list), everything I’ve seen has been close to home, which is fun. I like the challenge of trying to see as much as I can in Maryland. That Northern Parula that I saw in PA was also my first attempt at a video of a bird. For August, I’m hoping to match or exceed the total birds I saw in July, which will require some effort to see some new species I think. I saw my first Cliff Sparrow yesterday, which is the newest new species on my list. I’m up to 42 in August so far, which might seem high for only 8 days, but I expect that number to hover around 45-50 for most of the month, as I spend most of my time at Lake Roland, and aside from some lucky sightings, I tend to see the same birds every time. As far as writing goes, it’s happening, but it’s still slow. I’ve been enjoying every possible moment I can with Harrison, which pushes writing time to after he heads to bed. Most of the time, when he’s asleep, I’m already dead to the world, and I find that I’m squeezing 100-300 words a night, if that. It’s better than nothing, but I think I’m still in the adjustment period as far as writing and parenthood. Every time I think I’ve got that kid figured out, he changes course, which, really, is part of the fun. He really enjoys being out in nature, looking at deer and especially the dogs being walked. So, if you couldn’t tell by all the bird posts, H and Nat and I spend a lot of time outdoors these days. But I do have two writing projects in the works that I might be able to blog about in the not so near future. Both I am really excited about.